You helped Courage save Muriel with HabboCreate! Founded originally back in 2002. Mutalist, who was the original Founder of the Satanic House™ founded this room. 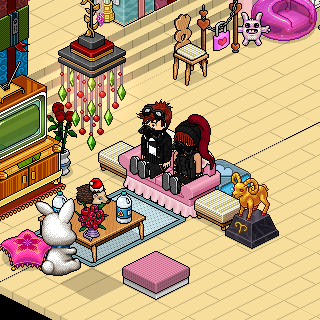 It was a newsbox/snewsbox style room, and was a very popular hangout back in the early days of habbo. was just a word made up by someone whos afraid to get close. Welcome to the Choochoo Cafe! Enjoy the stay! One more drink, one more pill, just one more line to make me feel like I have something left to give, cause without it I'm just giving in, this vicious circle has no end, it spirals down and descends into hell, there’s nothing here that can save me now. Failure's No Option. Don't let the mistakes of the past determine your future. I'M NOT TOPH, I'M MELON LORD MWAAHHAHAHAHHHAH!!! oh angel sent from up above you know you make my world light up when I was down when I was hurt you came to lift me up. Nothing special about this room.